What is a seducing spirit? When we hear the word ‘seduce,’ we think of soap operas where a man seduces a woman into the bed. Or vice versa. We always think of it in a sensual way. That is part of what a seducing spirit really is. 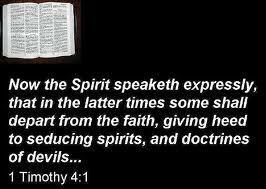 Now the Spirit speaketh expressly, that in the latter times some shall depart from the faith, giving heed to seducing spirits, and doctrines of devils.. The whole essence of seduction is that it is done through the five senses. We can be seduced by what we 1) SEE, what we 2) HEAR, what we 3) TOUCH, what we 4) TASTE, and what we 5) SMELL. The lie and the deception that man is tempted with always is done in the realm of our senses. In our soulish realms. The question is…can seducing spirits exist IN THE CHURCH? Because today, Christianity has become-for the most part-very sensual. Any attempt to access the spirit is done by way of our senses, and when this occurs, we open up ourselves to the demonic instead of the divine. And the spirit that seduces (or ministers) to many in the church is solely RELIGIOUS in nature! How many people do you know go to a church because of the music ministry? A slamming music ministry appeals to the NATURAL sense of HEARING. How many of you know someone who has said to you ‘I gotta go to a church that is clean, or where the interior is designed just right…’ or ‘When I go to church, it must look like THIS or THAT…’? Appeals to the NATURAL sense of SEEING. Let’s face it. Most of the people who go to church go to their church for carnal, fleshly, soulish, sensual reasons. The religious demons KNOW THIS, so that’s how they mimic a move of God, a touch of God, a word from God and package it so that it comes to you through ONE of the FIVE senses that appeals to FLESH. And once the bait is bitten, YOU HAVE BEEN SEDUCED!!!!!! The church has little knowledge when it comes to understanding demonic seduction by religious demons. Religious demons are in full control of the organized church. These seducing spirits have imbedded themselves into the very walls and pulpits of the organized church. Seducing spirits live in the organized church, inside their human hosts, and they are quite comfortable there. The demand has been for a church that appeals to man’s senses. And all this is-the whole matter of religious demons seeped into the very foundations of these monuments and idols we call churches-is THE DEVIL giving man what they desire, what they demand more of. Seducing spirits, in the form of religious demons, have taken up office in the organized church. Religious demons crept into the organized church and every last person, down to the preacher, was just plain unaware, thinking all the time what they are experiencing is a move of God. The organized church doesn’t want to know a thing about seducing spirits. They show no interest, and couldn’t give a hoot about a seducing spirit takeover in the form of the religious demon. Why? Because they themselves are now hosting religious demons within themselves. Do you see how a seducing spirit manifesting through a religious demon could make you go to a church? If you are ready for the truth about seducing spirits/religious demons and their new home, the organized church, you MUST get a copy of Pam Sheppard’s book, Faces of a Religious Demon. Stay tuned to Part 2 of Seducing Spirits!